Cross-sectional area distribution along the body determines wave drag, largely independent of the actual shape. Although not congruent, the blue and light green shapes are roughly equal in area. The Whitcomb area rule, also called the transonic area rule, is a design technique used to reduce an aircraft's drag at transonic and supersonic speeds, particularly between Mach 0.75 and 1.2. This is one of the most important operating speed ranges for commercial and military fixed-wing aircraft today, with transonic acceleration being considered an important performance metric for combat aircraft and necessarily dependent upon transonic drag. At high-subsonic flight speeds, the local speed of the airflow can reach the speed of sound where the flow accelerates around the aircraft body and wings. The speed at which this development occurs varies from aircraft to aircraft and is known as the critical Mach number. The resulting shock waves formed at these points of sonic flow can result in a sudden increase in drag, called wave drag. To reduce the number and power of these shock waves, an aerodynamic shape should change in cross sectional area as smoothly as possible. The area rule says that two airplanes with the same longitudinal cross-sectional area distribution have the same wave drag, independent of how the area is distributed laterally (i.e. in the fuselage or in the wing). Furthermore, to avoid the formation of strong shock waves, this total area distribution must be smooth. As a result, aircraft have to be carefully arranged so that at the location of the wing, the fuselage is narrowed or "waisted", so that the total area does not change much. Similar but less pronounced fuselage waisting is used at the location of a bubble canopy and perhaps the tail surfaces. The area rule also holds true at speeds exceeding the speed of sound, but in this case, the body arrangement is in respect to the Mach line for the design speed. For example, consider that at Mach 1.3 the angle of the Mach cone formed off the body of the aircraft will be at about μ = arcsin(1/M) = 50.3° (where μ is the angle of the Mach cone, or simply Mach angle, and M is the Mach number). In this case the "perfect shape" is biased rearward; therefore, aircraft designed for high speed cruise usually have wings towards the rear. A classic example of such a design is the Concorde. When applying the transonic area rule, the condition that the plane defining the cross-section meets the longitudinal axis at the Mach angle μ no longer prescribes a unique plane for μ other than the 90° given by M = 1. The correct procedure is to average over all possible orientations of the intersecting plane. A superficially related concept is the Sears–Haack body, which is the shape with the minimum wave drag for a given length and a given volume. However, the Sears–Haack body shape is derived starting with the Prandtl–Glauert equation which governs small-disturbance supersonic flows. But this equation is not valid for transonic flows where the area rule applies. So although the Sears–Haack body shape, being smooth, will have favorable wave drag properties according to the area rule, it is not theoretically optimum. Junkers patent drawing from March 1944. The area rule was discovered by Otto Frenzl when comparing a swept wing with a w-wing with extreme high wave drag while working on a transonic wind tunnel at Junkers works in Germany between 1943 and 1945. He wrote a description on 17 December 1943, with the title "Arrangement of Displacement Bodies in High-Speed Flight"; this was used in a patent filed in 1944. The results of this research were presented to a wide circle in March 1944 by Theodor Zobel at the Deutsche Akademie der Luftfahrtforschung (German Academy of Aeronautics Research) in the lecture "Fundamentally new ways to increase performance of high speed aircraft." Subsequent German wartime aircraft design took account of the discovery, evident in slim mid-fuselage of aircraft including the Messerschmitt P.1112, P.1106 and Focke-Wulf 1000x1000x1000 type A long-range bomber, but also apparent in delta wing designs including the Henschel Hs 135. Several other researchers came close to developing a similar theory, notably Dietrich Küchemann who designed a tapered fighter that was dubbed the "Küchemann Coke Bottle" when it was discovered by US forces in 1946. In this case Küchemann arrived at the theory by studying airflow, notably spanwise flow, over a swept wing. The swept wing is already an indirect application of the area rule. 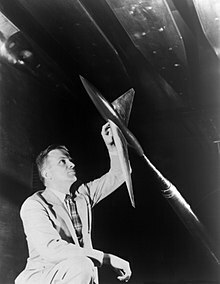 Wallace D. Hayes, a pioneer of supersonic flight, developed the transonic area rule in publications beginning in 1947 with his Ph.D. thesis at the California Institute of Technology. Richard T. Whitcomb, after whom the rule is named, independently discovered this rule in 1952, while working at the NACA. While using the new Eight-Foot High-Speed Tunnel, a wind tunnel with performance up to Mach 0.95 at NACA's Langley Research Center, he was surprised by the increase in drag due to shock wave formation. Whitcomb realized that, for analytical purposes, an airplane could be reduced to a streamlined body of revolution, elongated as much as possible to mitigate abrupt discontinuities and, hence, equally abrupt drag rise. The shocks could be seen using Schlieren photography, but the reason they were being created at speeds far below the speed of sound, sometimes as low as Mach 0.70, remained a mystery. In late 1951, the lab hosted a talk by Adolf Busemann, a famous German aerodynamicist who had moved to Langley after World War II. He talked about the behavior of airflow around an airplane as its speed approached the critical Mach number, when air no longer behaved as an incompressible fluid. Whereas engineers were used to thinking of air flowing smoothly around the body of the aircraft, at high speeds it simply did not have time to "get out of the way", and instead started to flow as if it were rigid pipes of flow, a concept Busemann referred to as "streampipes", as opposed to streamlines, and jokingly suggested that engineers had to consider themselves "pipefitters". Several days later Whitcomb had a "Eureka" moment. The reason for the high drag was that the "pipes" of air were interfering with each other in three dimensions. One does not simply consider the air flowing over a 2D cross-section of the aircraft as others could in the past; now they also had to consider the air to the "sides" of the aircraft which would also interact with these streampipes. Whitcomb realized that the shaping had to apply to the aircraft as a whole, rather than just to the fuselage. That meant that the extra cross-sectional area of the wings and tail had to be accounted for in the overall shaping, and that the fuselage should actually be narrowed where they meet to more closely match the ideal. The area rule was immediately applied to a number of development efforts. One of the most famous of these developments was Whitcomb's personal work on the re-design of the Convair F-102 Delta Dagger, a U.S. Air Force jet fighter that was demonstrating performance considerably worse than expected. By indenting the fuselage beside the wings, and (paradoxically) adding more volume to the rear of the plane, transonic drag was considerably reduced and the intended Mach 1.2 design speed was reached. The culminating design of this research was the Convair F-106 Delta Dart, an aircraft which for many years was the USAF's primary all-weather interceptor. Numerous designs of the era were likewise modified in this fashion, either by adding new fuel tanks or tail extensions to smooth out the profile. The Tupolev Tu-95 'Bear', a Soviet-era bomber, has large bulged landing gear nacelles behind the two inner engines, increasing the aircraft's overall cross section aft of the wing root. Its airliner version has been the fastest propeller-driven aircraft in the world since 1960. The Convair 990 used a similar solution, adding bumps called antishock bodies to the trailing edge of the upper wing. The 990 remains the fastest U.S. airliner in history, cruising at up to Mach 0.89. Designers at Armstrong-Whitworth took the concept a step further in their proposed M-Wing, in which the wing was first swept forward and then to the rear. This allowed the fuselage to be narrowed on either side of the root instead of just behind it, leading to a smoother fuselage that remained wider on average than one using a classic swept wing. One interesting outcome of the area rule is the shaping of the Boeing 747's upper deck. The aircraft was designed to carry standard intermodal containers in a two-wide, two-high stack on the main deck, which was considered a serious accident risk for the pilots if they were located in a cockpit at the front of the aircraft. They were instead moved above the deck in a small "hump", which was designed to be as small as possible given normal streamlining principles. It was later realized that the drag could be reduced much more by lengthening the hump, using it to reduce wave drag offsetting the tail surface's contribution. The new design was introduced on the 747-300, improving its cruise speed and lowering drag, with the side effect of slightly increasing capacity on passenger flights. Aircraft designed according to Whitcomb's area rule (such as the Blackburn Buccaneer and the Northrop F-5) looked odd at the time they were first tested and were dubbed "flying Coke bottles," but the area rule is effective and came to be an expected part of the appearance of any transonic aircraft. Later designs started with the area rule in mind, and came to look much more pleasing. Although the rule still applies, the visible fuselage "waisting" can only be seen on a few aircraft, such as the B-1B Lancer, Learjet 60, and the Tupolev Tu-160 'Blackjack'. The same effect is now achieved by careful positioning of aircraft components, like the boosters and cargo bay on rockets; the jet engines in front of (and not directly below) the wings of the Airbus A380; the jet engines behind (and not purely at the side of) the fuselage of a Cessna Citation X; the shape and location of the canopy on the F-22 Raptor; and the image of the Airbus A380 above showing obvious area rule shaping at the wing root, which is practically invisible from any other angle. ^ Jones, Robert T (1956), Supersonic area rule (PDF) (report), UK: NACA, 1284 . ^ https://ntrs.nasa.gov/archive/nasa/casi.ntrs.nasa.gov/19670030792.pdf nasa.gov. Retrieved April 6, 2015. ^ Heinzerling, Werner, Flügelpfeilung und Flächenregel, zwei grundlegende deutsche Patente der Flugzeugaerodynamik [Wing sweep and area rule, two basic German patents of aircraft aerodynamics] (PDF) (in German), München, DE: Deutsches Museum . ^ Patentschrift zur Flächenregel [Patent for the area rule] (PDF) (in German), 21 Mar 1944 . ^ Meier, Hans-Ulrich, Die Pfeilflügelentwicklung in Deutschland bis 1945 [The swept-wing development in Germany until 1945] (in German), pp. 166–99, ISBN 3-7637-6130-6 . ^ Wallace Hayes (obituary), Princeton . ^ Hallion, Richard P. "The NACA, NASA, and the Supersonic-Hypersonic Frontier" (PDF). NASA. NASA Technical Reports Server. Retrieved 8 September 2011. ^ Wallace 1998, p. 144. ^ Wallace 1998, p. 147. Wallace, Lane E (1998). "5". In Mack, Pamela E (ed.). The Whitcomb Area Rule: NACA Aerodynamics Research and Innovation. From Engineering Science to Big Science. NASA. pp. 144–47. Retrieved August 29, 2012. Area rule explained, Aerospace Web. Whitcomb Area Rule and Küchemann Carrots, Aerospace Web. German patent search system – look for Patent DE 932410 filed March 21, 1944. See Image 4 for an extreme example: fuselage before wing, PBS. The Whitcomb Area Rule: NACA Aerodynamics Research and Innovation, History Nasa. ""A Study of the Zero-Lift Drag-Rise Characteristics of Wing-Body Combinations Near the Speed of Sound"". (1.31 MB), Whitcomb, Richard T, NACA Report 1273, 1956.